Join the discussion on our forums! 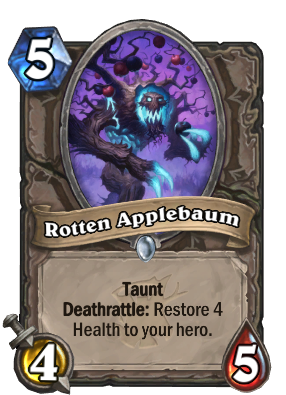 Come discuss Rotten Applebaum over in our dedicated Rotten Applebaum discussion topic. Deathrattle: Restore 4 Health to your hero. Key ingredient in Gilnean applesauce. Location: In your books. Exactly. It has one of the best play sounds in the set. My number one craft this expansion. Along with Lady in White. Seems similar to Sludge Belcher and he used to be the best taunt in game. Very good in my opinion. Sludge belcher was the best NEUTRAL taunt in the game because the opponent always lost at least 2 attacks. This is completely different. Good that they put it on deathrattle. I would to love to see it as battlecry but then it would've been plain broken. This card may actually be the perfect anti-aggro heal we've been waiting for. N'Zoth welcomes their newest friend to join them in wild. Deathrattle, taunt, unconditional healing. Exactly what I've been hoping for. I like this card alot, I think of it as a more defensive version of Antique Healbot I will throw it into my Jurassic Hunter and Reno Demon Warlock for sure! Look forward to playing it. This will be a staple card in Quest Warrior. Hard to say, if you run Baku (which you really should), you would practically start off with 30 Health and 4 Armor, and the Armor just keeps building on against most matchups, so the 4 Health will probably be wasted. This is why Health restoration is not a popular tool in general for Warrior. Great tool for the deck against aggro for sure tho, with the Restore wasted or not.